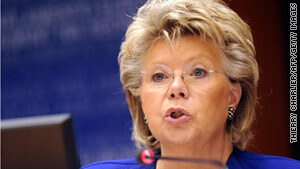 Viviane Reding, vice president for justice of the European Commission, strongly condemend the Roma deportations. (CNN) -- The European Commission on Wednesday issued a warning to France over its immigration policies after the deportations of more than 8,000 ethnic Roma -- commonly known as gypsies -- and set a deadline for coming into compliance with EU immigration practices. The commission said France didn't specifically target the Roma when it conducted raids recently at camps in Lyon, France, and other cities that forced out a total of 8,300 Romanian and Bulgarian nationals of Roma origin. The conclusions came after an inquiry into the issue. French officials said the raids were part of a broader crackdown on illegal immigration, and the commission noted that "measures taken by the French authorities since this summer did not have the objective or the effect of targeting a specific ethnic minority, but treated all EU citizens in the same manner." The commission also noted that French officials had offered assurances that administrative guidance not in compliance with "EU law on free movement of people" had been "annulled and replaced," and that authorities will enforce EU law "in line with the Treaties and the EU Charter of Fundamental Rights" in a non-discriminatory manner. However, the commission warned France that it must adopt European Union rules on freedom of movement soon. "France has not yet transposed the Directive on Free Movement into national legislation that makes these rights fully effective and transparent," the commission said. "Therefore, the commission decided today that it will issue a letter of formal notice to France requesting the full transposition of the directive, unless draft transposition measures and a detailed transposition schedule are provided by 15 October 2010." Last week, Viviane Reding, vice president for justice of the European Commission, the executive arm of the European Union, said she was "appalled by a situation which gave the impression that people are being removed from a member state of the European Union just because they belong to a certain ethnic minority,"
"Let me be very clear: Discrimination on the basis of ethnic origin or race has no place in Europe," she added. Reding's comments triggered a prompt reaction from Bernard Valero, a spokesman for the French Foreign Ministry. "We are astonished by Viviane Reding's declaration, which seems excessive and out of context," he said. "This is an extremely serious topic, and we must not get wrapped up in a useless polemic." The expulsion of Roma without identity papers has drawn international criticism, with some comparing it to the deportation of Jews during World War II. "This is a situation I had thought Europe would not have to witness again after the Second World War," Reding said. Roma are a group of people who live mainly in southern and eastern Europe, often in poverty. They tend to live in camps, caravans or informal settlements and have been the target of persecution throughout history.